All of our training courses follow the syllabus guidelines outlined in the ISO 18404 standard published 2015. This International Standard for Lean Six Sigma sets out to clarify the required competencies for personnel and organizations in Six Sigma, Lean and “Lean & Six Sigma”. Because of the ambiguity of the many combinations of Lean and Six Sigma, currently termed “Lean Six Sigma”, this International Standard will use the term “Lean & Six Sigma”. Before this, there had been no universal standard on what constitutes a Black Belt or what is required in an organization which deploys these approaches. 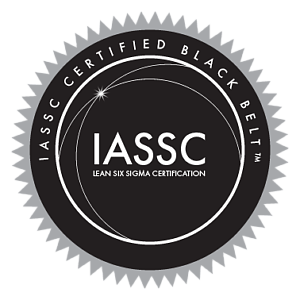 For example, if an organization advertises for a Six Sigma Black Belt, how can they be sure of the level of ability of a “Black Belt”? If a supplier says it is deploying Six Sigma or perhaps Lean, how can a customer be sure of their real abilities? A fundamental purpose of this International Standard is to assist in the answer of such questions. Much debate has been had on the nature of Six Sigma and Lean, their commonality and their differences. Protagonists have argued over the content, overlap, application, supremacy and purpose of the two approaches. Various combinations of the two approaches exist, many under the umbrella title of “Lean Six Sigma”. Six Sigma and Lean have a commonality of field of application, i.e. process improvement. Lean focuses on reducing ‘chronic’ waste and Six Sigma focuses on reducing the variation and thereby its adverse effects. This International Standard therefore sets out the separate competency requirements for Six Sigma and Lean implementation; it also sets out a combined competency framework for “Lean & Six Sigma”. In so doing, it focuses on the competencies (skills and abilities) to deliver benefits to an organization rather than defining the specific educational level required for each role. Candidates will be expected to demonstrate that they have an adequate level of competence, an amalgamation of education, training, skills and experience necessary to fulfil their roles. In its preparation, it has been seen to be helpful to prepare this International Standard by focusing on Six Sigma, Lean implementation and “Lean & Six Sigma” separately and the user will come across different tables dealing with these subjects. This International Standard defines the competencies for the attainment of specific levels of competency with regards to Six Sigma, Lean, and “Lean & Six Sigma” in individuals, e.g. Black Belt, Green Belt and Lean practitioners and their organizations. Yellow Belt is not included in this International Standard. 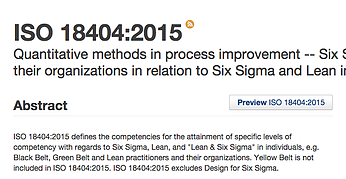 This International Standard excludes Design for Six Sigma. NOTE: This International Standard sets out the required competencies for individual certification and/or an organization’s certificate. The following documents, in whole or in part, are normatively referenced in this document and are indispensable for its application. For dated references, only the edition cited applies. For undated references, the latest edition of the referenced document (including any amendments) applies. For the purposes of this document, the following terms and definitions apply. Note 1 to entry: This authority can be either internal or external to the organization.